Does not react with GFAP, neurofilamen or desmin. WB: HeLa and MOLT4 whole cell lysates. ICC/IF: HeLa cells. IHC-P - Human kidney FFPE tissue sections. Flow Cyt: MDA-MB-231 cells, SV40LT-SMC cells. This monoclonal antibody to vimentin has been knockout validated in ICC/IF. The expected staining was observed in wild type cells and no staining was seen in vimentin knockout cells. Our Abpromise guarantee covers the use of ab8069 in the following tested applications. Flow Cyt Use 0.1-1µg for 106 cells. IHC-P Use a concentration of 0.5 - 5 µg/ml. Perform heat mediated antigen retrieval before commencing with IHC staining protocol. WB Use a concentration of 1 µg/ml. Detects a band of approximately 57 kDa (predicted molecular weight: 54 kDa). Involved with LARP6 in the stabilization of type I collagen mRNAs for CO1A1 and CO1A2. Highly expressed in fibroblasts, some expression in T- and B-lymphocytes, and little or no expression in Burkitt's lymphoma cell lines. Expressed in many hormone-independent mammary carcinoma cell lines. The central alpha-helical coiled-coil rod region mediates elementary homodimerization. The [IL]-x-C-x-x-[DE] motif is a proposed target motif for cysteine S-nitrosylation mediated by the iNOS-S100A8/A9 transnitrosylase complex. Filament disassembly during mitosis is promoted by phosphorylation at Ser-55 as well as by nestin (By similarity). One of the most prominent phosphoproteins in various cells of mesenchymal origin. Phosphorylation is enhanced during cell division, at which time vimentin filaments are significantly reorganized. Phosphorylation by PKN1 inhibits the formation of filaments. Phosphorylated at Ser-56 by CDK5 during neutrophil secretion in the cytoplasm. Phosphorylated by STK33. O-glycosylated during cytokinesis at sites identical or close to phosphorylation sites, this interferes with the phosphorylation status. Vimentin is found in connective tissue and in the cytoskeleton. Western blot - Anti-Vimentin antibody [V9] - Cytoskeleton Marker (ab8069)Image from Tange S et al., PLoS One. 2014;9(12):e115684. Fig 9(H). ; doi: 10.1371/journal.pone.0115684. ab8069 staining Vimentin (colored green) in wild-type HAP1 cells (top panel) and VIM knockout HAP1 cells (bottom panel). The cells were fixed with 100% methanol (5min), permeabilized with 0.1% Triton X-100 for 5 minutes and then blocked with 1% BSA/10% normal goat serum/0.3M glycine in 0.1% PBS-Tween for 1h. The cells were then incubated with ab8069 at 0.5μg/ml and ab202272 (Rabbit monoclonal [EP1332Y] to alpha Tubulin (Alexa Fluor® 594)) at 1/250 dilution overnight at +4°C, followed by a further incubation at room temperature for 1h with ab150117 (Goat secondary antibody to Mouse IgG (Alexa Fluor® 488)) at 2 μg/ml (colored green). Nuclear DNA was labelled in blue with DAPI. Lanes 1 - 4: Merged signal (red and green). Green - ab8069 observed at 57 kDa. 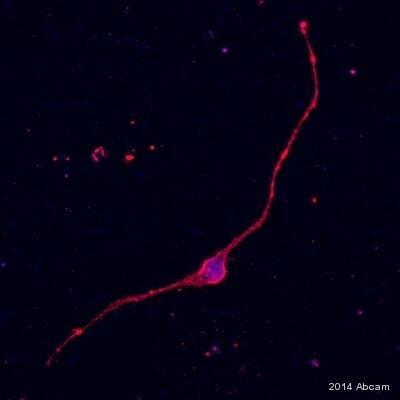 Red - loading control, ab181602, observed at 37 kDa. ab8069 was shown to specifically react with Vimentin in wild-type HAP1 cells as signal was lost in VIM (Vimentin) knockout cells. Wild-type and VIM (Vimentin) knockout samples were subjected to SDS-PAGE. Ab8069 and ab181602 (Rabbit anti-GAPDH loading control) were incubated overnight at 4°C at 1 μg/ml and 1/10000 dilution respectively. Blots were developed with Goat anti-Mouse IgG H&L (IRDye® 800CW) preabsorbed ab216772 and Goat anti-Rabbit IgG H&L (IRDye® 680RD) preabsorbed ab216777 secondary antibodies at 1/10000 dilution for 1 hour at room temperature before imaging. IHC image of ab8069 staining Vimentin in normal human kidney formalin-fixed paraffin-embedded tissue sections*, performed on a Leica Bond. The section was pre-treated using heat mediated antigen retrieval with sodium citrate buffer (pH6, epitope retrieval solution 1) for 20 mins. The section was then incubated with ab8069, 1/500 dilution, for 15 mins at room temperature and detected using an HRP conjugated compact polymer system. DAB was used as the chromogen. The section was then counterstained with haematoxylin and mounted with DPX. No primary antibody was used in the negative control (shown on the inset). ab8069 staining Vimentin in HeLa cells. The cells were fixed with 4% formaldehyde (10min), permeabilized with 0.1% Triton X-100 for 5 minutes and then blocked with 1% BSA/10% normal goat serum/0.3M glycine in 0.1%PBS-Tween for 1h. The cells were then incubated overnight at +4°C with ab8069 at 1/100 dilution (shown in green) and ab195889, Mouse monoclonal to alpha Tubulin (Alexa Fluor® 594), at 2µg/ml (shown in red). Nuclear DNA was labelled with DAPI (shown in blue). ab8069 staining Vimentin in Human oral cavity tissue sections by Immunohistochemistry (Formalin/PFA-fixed paraffin-embedded sections). Tissue was fixed with paraformaldehyde and blocked with ab64226 Protein Block for 5 minutes at 25°C; antigen retrieval was by heat mediation in pH 6 buffer . Samples were incubated with primary antibody (1/1000 in 10% NGS) for 16 hours at 4°C. An undiluted biotinylated goat anti-rabbit polyclonal IgG was used as the secondary antibody. ab8069 staining Vimentin in human epithelial ovarian serous adenocarcinoma cell line SKOV-3 by Immunocytochemistry/ Immunofluorescence. Samples were fixed with 4% PFA in PBS pH 7.4 and then permeabilised using 0.2% saponin for 30 minutes. A blocking step was performed using 1% BSA/PBS for 1 hour. Samples were then incubated with ab8069 at a 1/200 dilution in 1% BSA/PBS for 1 hour. 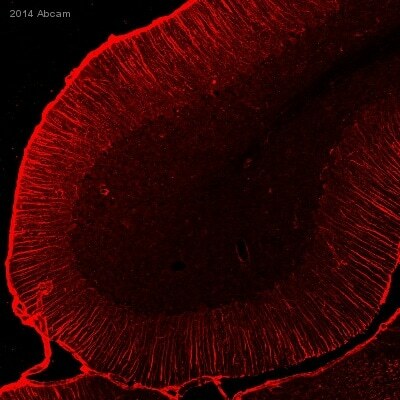 The secondary antibody was a goat anti-mouse Alexa 488 (green) diluted 1/1000, 1% BSA/PBS for 1 hour. Samples were then incubated with phalloidin (red for actin staining) in 1% BSA/PBS for 45 minutes and counterstained with DAPI (blue for nuclei staining) in PBS for 45 minutes. 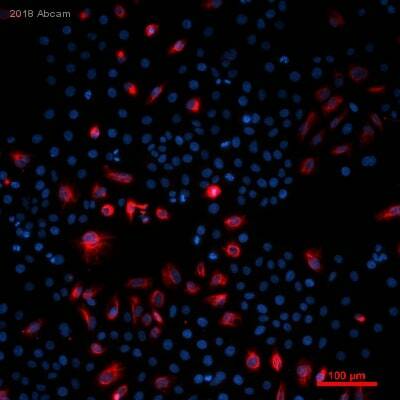 ab8069 staining Vimentin in pig cardiac fibroblasts by ICC/IF (Immunocytochemistry/immunofluorescence). Cells were fixed with acetone and permeabilized with 0.1% Triton X-100. Samples were incubated with primary antibody (1/100 in PBS pH 7.4) for 30 minutes. A FITC-conjugated goat anti-mouse IgG polyclonal (1/20) was used as the secondary antibody. 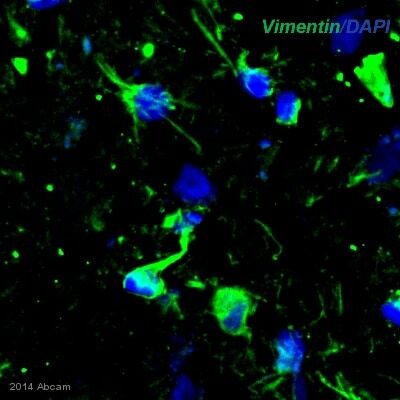 ab8069 staining Vimentin in rat glial cells by ICC/IF (Immunocytochemistry/immunofluorescence). Cells were fixed with formaldehyde and blocked with 1% BSA for 10 minutes at 25°C. Samples were incubated with primary antibody (1/200) for 10 hours at 4°C. An Alexa Fluor® 555-conjugated anti-mouse IgG polyclonal (1/300) was used as the secondary antibody. Overlay histogram showing SV40LT-SMC cells stained with ab8069 (red line). The cells were fixed with 4% formaldehyde (10 min) and then permeabilized with 0.1% PBS-Triton X-100 for 20 min. The cells were then incubated in 1x PBS / 10% normal goat serum / 0.3M glycine to block non-specific protein-protein interactions followed by the antibody (ab8069, 0.1μg/1x106 cells) for 30 min at 22ºC. 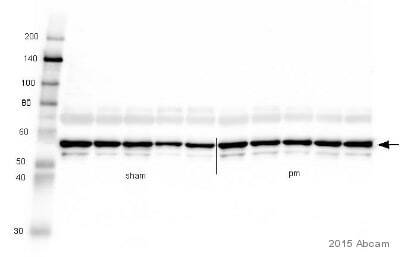 The secondary antibody used was Alexa Fluor® 488 goat anti-mouse IgG (H&L) (ab150113) at 1/2000 dilution for 30 min at 22ºC. Isotype control antibody (black line) was mouse IgG1 [ICIGG1] (ab91353, 0.1μg/1x106 cells) used under the same conditions. Unlabelled sample (blue line) was also used as a control. This antibody gave a positive signal in SV40LT-SMC cells fixed with 80% methanol (5 min)/permeabilized with 0.1% PBS-Triton X-100 for 20 min used under the same conditions. Overlay histogram showing MDA-MB-231 cells stained with ab8069 (red line). The cells were fixed with 4% formaldehyde (10 min) and then permeabilized with 0.1% PBS-Triton X-100 for 20 min. The cells were then incubated in 1x PBS / 10% normal goat serum / 0.3M glycine to block non-specific protein-protein interactions followed by the antibody (ab8069, 1μg/1x106 cells) for 30 min at 22ºC. The secondary antibody used was Alexa Fluor® 488 goat anti-mouse IgG (H&L) (ab150113) at 1/2000 dilution for 30 min at 22ºC. Isotype control antibody (black line) was mouse IgG1 [ICIGG1] (ab91353, 1μg/1x106 cells) used under the same conditions. Unlabelled sample (blue line) was also used as a control. This antibody gave a positive signal in MDA-MB-231 cells fixed with 80% methanol (5 min)/permeabilized with 0.1% PBS-Triton X-100 for 20 min used under the same conditions. 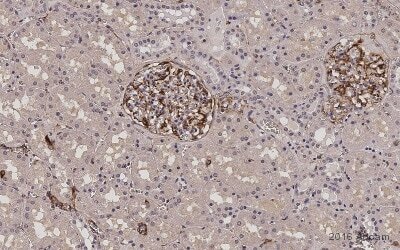 IHC image showing no staining when ab8069 was used on mouse kidney formalin fixed paraffin embedded tissue, using MOM detection kit, ab127055. The section was pre-treated using pressure cooker heat mediated antigen retrieval with sodium citrate buffer (pH6) for 30 mins. The section was incubated with ab8069 at 5 µg/ml for 15 mins at room temperature. DAB was used as the chromogen. The section was counterstained with haematoxylin and mounted with DPX.